While technicians, marketers, and CEOs used to the WCDMA standard of 5MHz cells are arguing for 15/15/15 or 20/20/5 splits, other combinations are possible in LTE, as explained in this Motorola Technical White Paper and shown in the following diagram. Blue blocks represent national cellular carriers, and lettered blocks represent a three, four, or six way subdivision of spectrum, allowing a sectorized cellular approach to deployment. 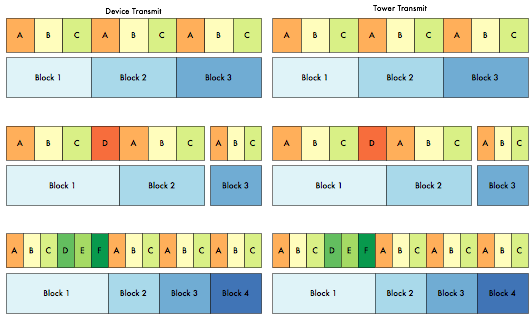 Small players in the market have also requested blocks that deviate from the APT Harmonized plan, for use with inexpensive WiMAX and WiFi equipment. These deviations would leave New Zealand’s spectrum incompatible with the rest of the Asia Pacific region, and while enabling smaller players, would disadvantage users on the whole, as WiMAX and WiFi are less efficient, scalable, and manageable technologies than LTE. From a commercial standpoint, many voices have been raised against the incumbent players. In the digital dividend process scoping workshop run by the MED in April 2011, the Police, Woosh Wireless, and Call Plus were all vocal in requesting the new spectrum not all go to incumbent carriers. The Police in particular are echoing Australian calls for setting aside a block of 700MHz for Emergency Services. Maori groups, represented by Te Huarahi Tika Trust, and its commercial arm Hautaki Limited, assert they are entitled to radio spectrum, and via precedent of previous 3G auctions are looking for a block to be set aside for their purchase outside the auction process. It is likely a Maori owned block of spectrum would be eventually used by a cellular carrier, through a sale or lease arrangement such as the one Hautaki Limited currently have with 2Degrees Mobile. Some smaller players believe the technical decision to plan 700MHz for LTE and harmonize with Asia Pacific is a mistake, and would consign New Zealand to “a 1990’s cellular telco timewarp back water”. Their argument however treats 700MHz as the only suitable spectrum for development, and fails to see 700MHz in the greater context of VHF and UHF spectrum easily applied to the task of broadband communications. Considering spectrum from 100MHz to 3.5GHz, the 700MHz Digital Dividend is less than 3% of the total spectrum available. It’s just half of the amount of spectrum held by TelstraClear, a carrier with little in the way of wireless communications. It’s 25% of the amount of spectrum used by Digital TV broadcasting – an expensive and unnecessary technology given the presence of both commercial and free television on satellite. The table below puts the Digital Dividend Blocks in context with other spectrum general uses and specific users. Blocks are proportional by volume; the Compass block represents 1%, and the Navigation and Radiolocation block 28% of the total available spectrum. Calls for deviation from Asia Pacific technical standards in the 700MHz band are being made for commercial reasons – and are being made by parties without a solid grasp on the sheer amount of spectrum available, much of which is underutilized. 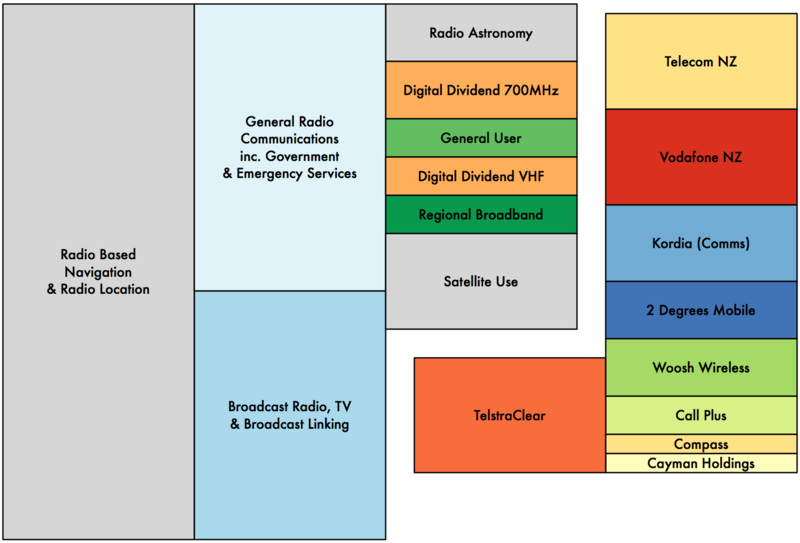 Far more suitable space for Emergency Services communications exists in the VHF Digital Dividend, or could be made available by refactoring existing 450 and 800MHz narrow-band land mobile blocks. Taking 700MHz away from commercial for Police use is misguided. New technologies such as 802.22 take advantage of “white spaces”, or underutilized spectrum, in vast swathes of broadcast and general radio communications spectrum. Ultra Wide Band (UWB) technology allows the use of far larger sections of underutilized spectrum, in particular radiolocation spectrum around 3GHz. LightSquared in the US has moved to repurpose satellite bandwidth for use with terrestrial transmitters in LTE deployment, as iHug Satellite once did in New Zealand via its Mt. Kaukau broadband repeater. Small players attempting to influence the MED in its development of 700MHz Digital Dividend policy in the hopes of picking up inexpensive spectrum would do well to learn about the New Zealand spectrum landscape, as detailed below, and new technologies that would allow them to utilize it without encroaching on spectrum badly needed to enhance the capacity of existing cellular data networks. Time and effort spent by small players on regulatory reform of other spectrum blocks would be of greater benefit to New Zealand than contesting the industry’s rational plan to harmonize with Asia Pacific.